Ever since RockShox brought its Bottomless Token system to market in 2014 alongside the re-release of the Pike, more riders have been considering air spring volume as a legitimate way of tuning their suspension. Fast-forward to 2018, and pretty much every major fork manufacturer has some way of easily adjusting air spring volume to alter how progressive or linear their suspension feels. Adding to that list, Formula’s Neopos is a product that’s also designed to affect volume and the behaviour of the air spring. 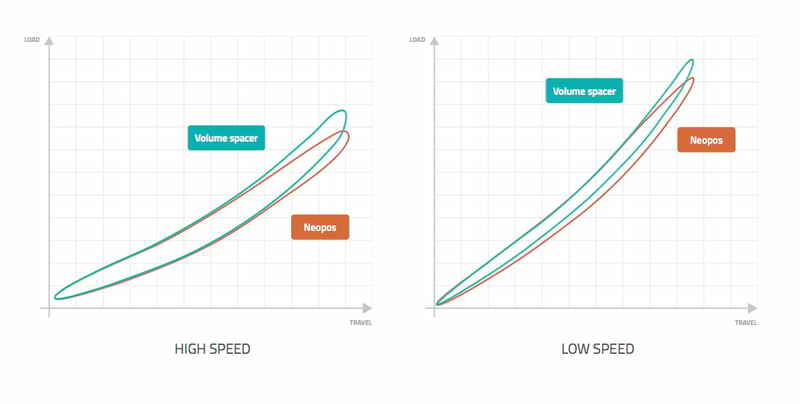 This however, ain’t no any ordinary volume spacer. Formula designed the Neopos spacer to adjust air spring volume inside its forks. 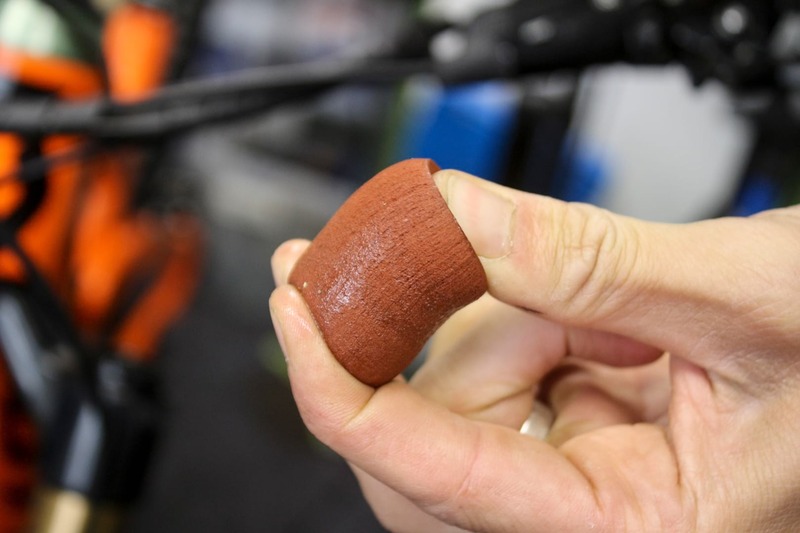 I first tested the Neopos volume spacer earlier this year at Bike Connection in Les Gets. I had it fitted to Formula’s new Selva R enduro fork, and was able to perform back-to-back runs at the bikepark to get a feel for what the spacer was doing inside the air spring. 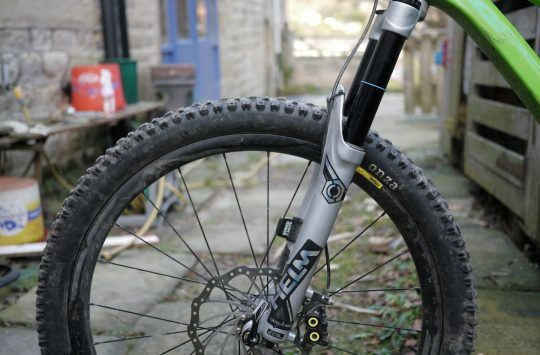 You can read about my initial experience with the new Selva R fork and the Neopos spacer here. I scored a few Neopos spacers at Bike Connection to take home with me, and since then we’ve tested them in a variety of air-sprung forks ranging from 120mm to 170mm of travel. We’ve run the spacer inside a Formula 35, a Selva, a couple of Fox 36’s and a 34 Step-Cast, as well as an X-Fusion McQueen. And the results have been interesting to say the least. Testing the Neopos spacer in Formula’s new Selva R fork back in June. Photo: Roo Fowler/Bike Connection. 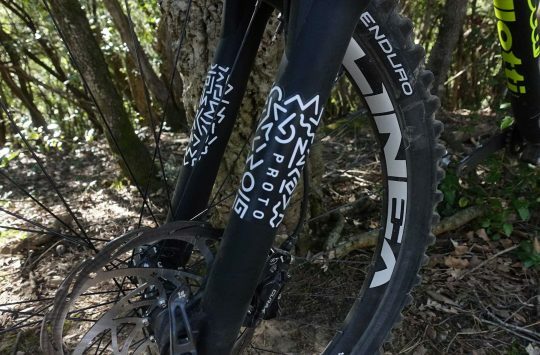 Formula’s Neopos is a volume spacer, and like those from RockShox and Fox, it’s designed to sit inside the fork’s air spring. This spacer isn’t made of rigid plastic though. Instead, it’s made from a squishy, compressible foam. Formula won’t tell us exactly what material the Neopos spacer is made from, but we do know that the spacers are manufactured in Italy by a company that specialises in closed-cell foam and nanotechnology. The foam is aerated with loads of tiny air bubbles throughout, and it’s these closed-cell air bubbles that allow the spacer to compress under pressure, before springing back to its original shape. Hold Up Sunshine, We’ve Seen Elastomers In Forks Before! Allow me to clarify – Neopos is not an elastomer, and shares absolutely nothing in common with the MCU dampers used in suspension forks from last century. Neopos sits inside the air spring chamber, and is only designed to compress by air pressure. Its function is not mechanical – nothing presses on it, and it is definitely not like some kind of physical bump-stop. It’s like a volume spacer, only squishy. Up until now, Formula forks have not used volume spacers. Instead, users have been able to add or subtract oil from inside the main air chamber to alter the air volume – a messy and somewhat faffy process. The Neopos spacer has emerged as a cleaner and simpler solution for altering a Formula fork’s spring rate. Just like a regular volume spacer, Neopos is designed to take up volume inside the air spring. You can use up to three of them, and the more you use the less air volume you have, and the more progressive your fork will feel. So far, so normal. Here’s where it gets interesting. Unlike a rigid volume spacer, the Neopos spacer compresses as air pressure increases. So as you go through the travel and air pressure builds inside the chamber, the Neopos spacer physically gets smaller in size. The effect of this compressible spacer can be described as an ‘easing out’ of the spring curve. Most air springs tend to have a very steep ramp-up in the last portion of the travel, where the internal air pressure builds rapidly. This is good for bottom-out support, but it can make the last third of the travel feel harsh and less usable. Because the Neopos spacer gets smaller as you push deeper into the travel though, it’s able to give all of that building air pressure a little extra breathing room. 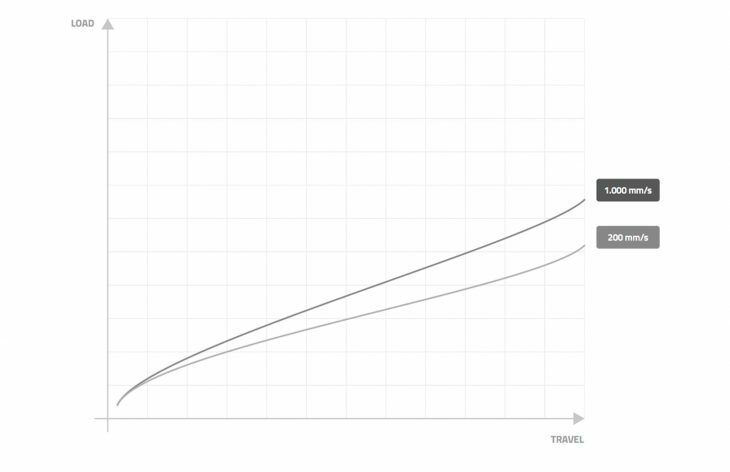 The gentler increase in air pressure results in a smoother and less harsh ramp-up at the end of the travel. To put it another way, the Neopos spacer helps to ‘linearise’ the air spring curve. It doesn’t make it completely linear like a coil spring, but it does produce a slightly flatter spring curve. 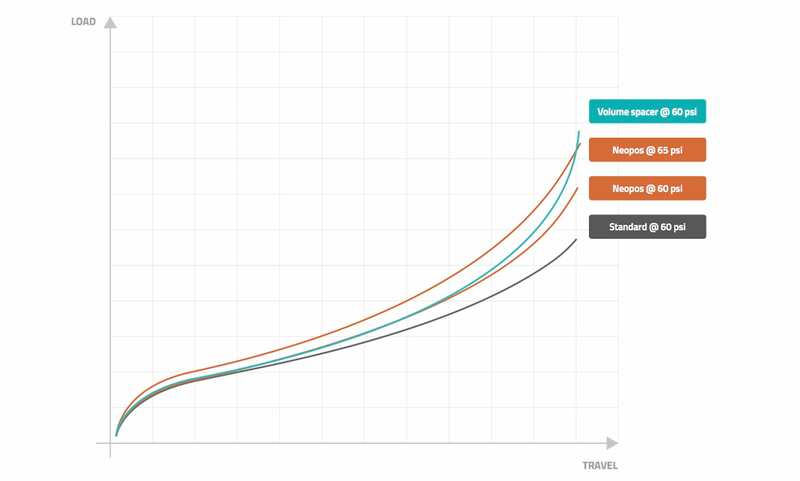 Note how much flatter the end of the spring curve is with the Neopos spacer, compared to a regular volume spacer. Despite its apparent simplicity though, there’s been a lot of testing since the original idea behind Neopos was born in 2011. Err, seven years to make a squishy bit of foam? During this testing process to find the right material and properties they were after, Formula’s team discovered some unexpected effects. The compressible volume spacer was doing what they hoped, but something else was going on. One of the keys to the performance of the Neopos spacer is its constant expansion time, which is just like a coil spring. “The science behind the Neopos was very new for us”, explains Vittorio. “We discovered something that we were not expecting at the first step. We spend a lot of time, since 2011, to understand the physics behind the Neopos and to develop the right product for MTB use”. What Vittorio is referring to here is how the Neopos spacer actually changes the way air behaves inside the air spring. To help visualise this, picture a coil spring on its own. When you compress a coil spring, its action is consistent and linear. Its response is also exactly the same regardless of how quickly you try to compress it. So it’ll compress the same amount whether you apply a force at low speed, or high speed. 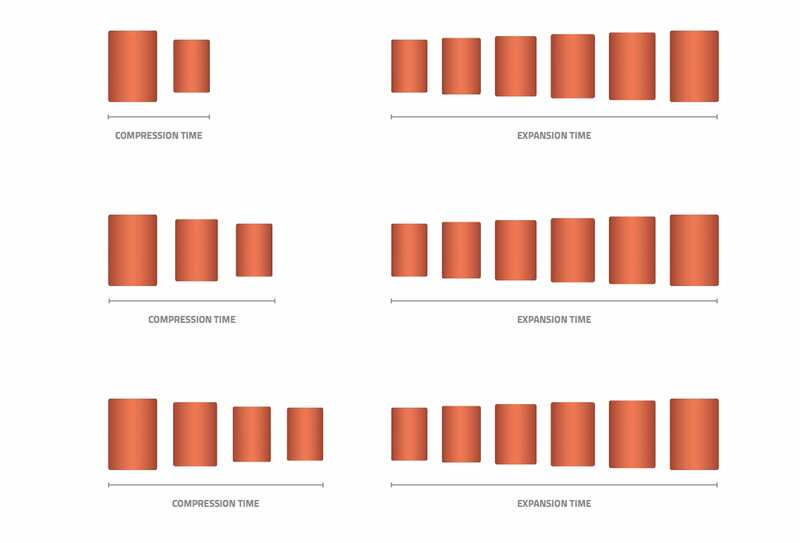 In comparison, the response of a traditional air spring isn’t constant, because the force required to compress the air spring is velocity dependent. Try to compress it really quickly, and you’ll need more force to achieve the same amount of travel. An air spring will change its behaviour depending on the speed of the force applied. When you add a Neopos spacer into the mix though, you’ve got something soft and squidgy in there that changes its compression rate depending on the force exerted on it. Put a small amount of pressure on it, and it compresses slowly. Put a load of pressure on it, and it compresses quickly. The key attribute however, is its expansion time. No matter how hard and fast that initial impact, the Neopos spacer will always rebound at the same rate – like a coil spring. It’s this constant rebound characteristic that goes some way to neutralising the speed-sensitive nature of an air-sprung fork. Again, it doesn’t match that of a coil spring, but according to Formula, the Neopos spacer will allow the fork’s action to be more consistent in its response, regardless of impact speed. The Neopos spacer won’t turn your air fork into a coil spring, but it will create more consistency across a range of speeds. I won’t admit to fully understanding the science behind what the Neopos spacer does inside a fork’s air spring. For those interested though, you can read more about the theory of what’s going on here. What I can say is that on the trail, it works. Formula introduced Neopos earlier this year as an upgrade solution for its existing forks. The new Selva R will come supplied with a Neopos spacer inside its air spring, but owners of existing Formula 33, 35, Selva and Nero forks will be able to buy a set of three Neopos spacers aftermarket for €29 and use it in their current fork. Testing the Neopos spacer in a Formula 35 fork. 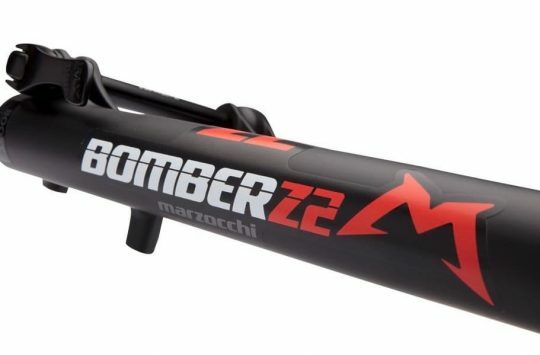 Though the Neopos spacer has been engineered specifically to work with Formula’s own forks, theoretically you can slot it into any air-sprung fork with 33mm or bigger stanchions. Of course Formula is very keen to stipulate that it doesn’t recommend this, partly because it hasn’t tested the Neopos spacer in other brand’s forks, and partly because those other brands aren’t likely to be pleased that you’re putting weird squidgy bits inside their product. 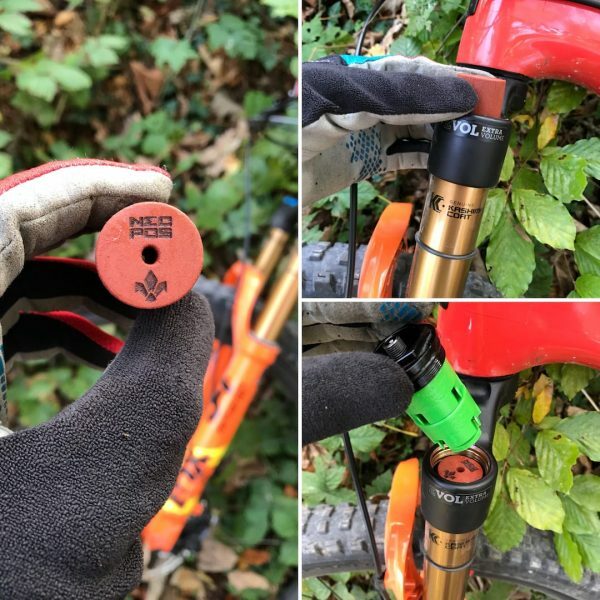 Though I’ve not experienced any damage or wrongdoing caused by using the Neopos spacer in the forks we’ve tested, it goes without saying that just like fitting an MRP Ramp Control cartridge or a Push ACS3 Conversion Kit, modifying your fork in any way will void the original manufacturer’s warranty. Got it? And testing it in a non-Formula fork. Fitting the Neopos spacer is as easy as it gets. After depressurising the air spring, you simply unthread the top cap and plop the Neopos spacer directly inside the air chamber. 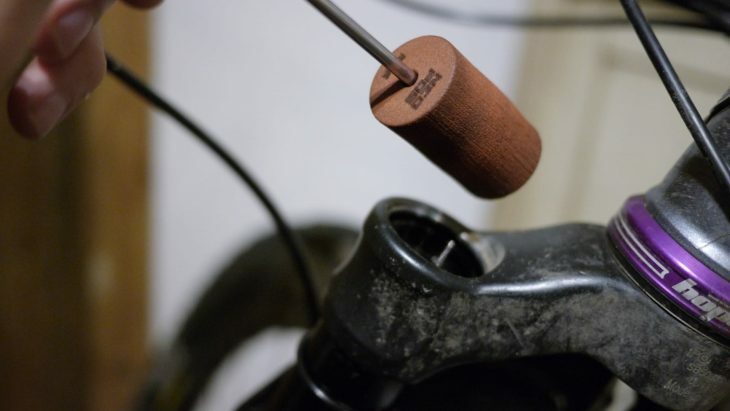 You don’t need to thread it into the top cap like you would with a normal plastic volume spacer, and it doesn’t attach to anything inside the fork. Although if floats around in there, it’s so light and soft that there is zero chance of you noticing it. I’m sure one of the other sites had them breaking up when used in another fork, probably due to different oils/fluid/grease. Good concept though! I might have missed this, but did you test the Neopos spacer back to back in the same fork with a rigid spacer of comparable volume at the same air pressure? On a slightly different note. I really hope that wills relocation across the pond doesn’t stop articles like this. I really enjoy them. I put one of these in an RLC FIT 34. I was amazed at the improvement in the ride. I thought it may placebo, or I removed it to check. It wasn’t. BWD, I imagine, assuming the spacer is the uncompressed size of the neopos then the spacered fork would be harsher on small stuff and harsher at the end of the stroke. 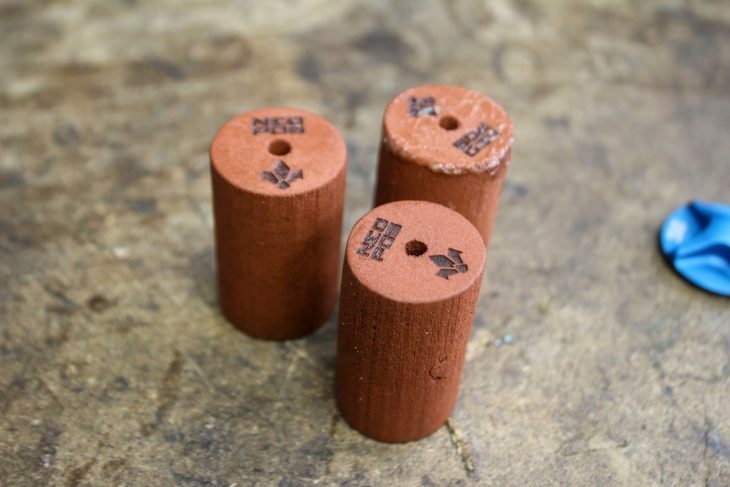 @rockthreegozy – That’s right, I believe it was Paul Aston from Pinkbike who had issues with one of the spacers he tested. @BadlyWiredDog – You bet! Figured I didn’t need to stipulate in the review that I performed back-to-back testing, but yes, I did. Swapping the Neopos spacer with a regular volume spacer and running the fork at the same pressure and damper settings produced a very different ride quality. Much plusher, and much more effective in the last 3rd travel. The behaviour of the air is also slightly different with the Neopos spacer in the air spring, so it takes some experimenting to work out what works best for you. In general, I found adding the Neopos spacer to my existing setup produced the best results. The 34 SC is the exception – I’ve now swapped one stock volume spacer with a Neopos spacer, and to counter the fork’s willingness to use full travel, I’ve bumped the air pressure up about 8psi. Despite the higher pressure, and higher ride height, the fork is still more compliant, which is impressive. @andybrad – Glad you enjoyed the article! And the plan is to continue with tech articles like this, so we’ll have plenty more coming your way! @LAT – Cheers for passing on the feedback, and good to hear you’ve had a positive experience! I’d say that was pretty fundamental tbh. Otherwise you’re just testing the effect of a volume spacer, no? Even if it’s a squishy one. So good to know you did just that. I’m running two in my 150mm Lyrik. Definitely prefer the way they feel to the plastic tokens. Only thing I’ve noticed is that they sometimes fold over on themselves inside the fork. Not sure if its an issue. @jonswhite – Yes, I have noticed this can happen from time to time. It doesn’t seem to be a problem. Just make sure if you’re trying to remove the spacer, use something that isn’t going to scratch the inside of the stanchions or leave any debris in the air spring. I used the end of a thin, wooden paint brush. @pb2 – Thank you for the kind words, and glad you liked the article! It takes a bit of experimenting with the Neopos spacer to get the right setting for you. With each fork I tested, I started by adding the Neopos spacer to the existing setup. From there, I’d play around with air pressures to see how the fork felt, and to measure how much travel I was getting. Then I’d experiment with removing one of the stock volume spacers while leaving the Neopos in. And again, play around with air pressures and see how much travel you’re using. One thing to note is that you may need to adjust your rebound damping due to the change in spring rate. I usually sped up the rebound one click with the Neopos spacer fitted. 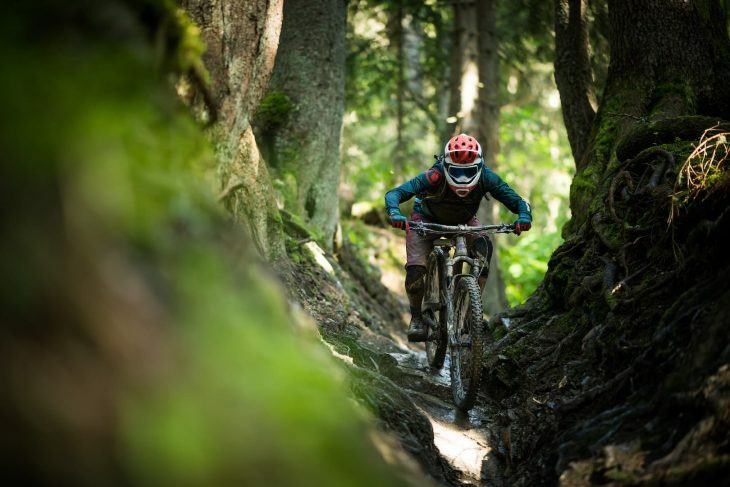 Why didn’t you try it in a Rockshox fork? I’d be interested how they’d work in a Pike. @asbrooks – Pretty simple reason – I haven’t had a test bike lately with a Pike on it 🙂 If I do get my hands on a Revelation/Pike/Yari/Lyrik in the near future though, I’ll be dropping one of these into it. I’ll keep you posted on any further findings mate!